In 1941, Shamsiah married her classmate Yasin Kina, as encouraged by her school principal. Shamsiah described herself as an obedient young woman who was keen to fulfill her parents’ wishes. Although Yasin was from a considerably wealthy family, she portrayed him as an irresponsible husband who was not employed. After three years, Yasin left her and divorced her without her knowledge, while she was eight months pregnant with their second child. Although they had two children, both passed away early due to poor nutrition and lack of access to healthcare. Shamsiah considered these moments in her life as constituting the roots of her burgeoning awareness of gender egalitarianism and men’s oppression of women. Although she had chance encounters with resistance fighters as a young adult, Shamsiah insisted that she only developed her political consciousness much later. One day in 1944, she received a letter containing Japanese propaganda about the Greater East Asia project. Out of curiosity, she sent a reply. The author identified himself as a young gentleman, Rusdi, from Sumatra. They continued exchanging letters and shortly after, he came to her village and asked her parents for her hand in marriage. Shamsiah agreed to the marriage, on the condition that he allowed her to pursue her religious studies. After five months of marriage, Rusdi divorced her. Shamsiah claimed that she eventually found out that he was a spy for the Japanese. 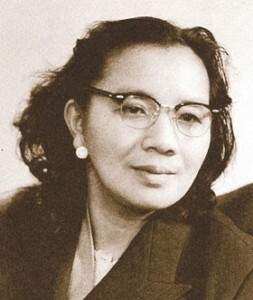 From 1946 onward, Shamsiah led the PKMM’s young women’s wing called Angkatan Wanita Sedar (AWAS). AWAS worked closely with the young men’s wing, Angkatan Lelaki Insaf Melayu (ALIM). AWAS was the first Malay women’s progressive organization that was primarily involved in the struggle for Malaya’s independence. As the leader, Shamsiah was engaged in grassroots activism. She went around villages giving talks about popular resistance, encouraged women to partake in the nationalist struggle, and collected donations for AWAS. AWAS also launched campaigns to tackle women’s illiteracy, as well as improve the standard of hygiene and midwifery. Like other PKMM members, Shamsiah had religious education, and thus often peppered her speeches with verses from the Quran and Hadith. Indeed, in her autobiography, Shamsiah presented her foundational studies in Islam as an integral part of her personal development. As a young Malay woman activist, she utilized her religious knowledge to derive and construct authority for herself. Even though she was speaking about male oppression, her religious acumen garnered her acceptance from the masses. Indeed, it is productive to question if Shamsiah’s appeal to religion in her fiery speeches contributed to the audience’s acceptability of her radicalism, and if she queried the politics of respectability that undergird her activism. On 20th October 1946, PUTERA and AMCJA organized a workers’ strike, affecting the economy. Historian T. N. Harper (1998) attributes AWAS’ initial appeal to the sense of disenchantment that Malay women felt as a result of the inadequacy demonstrated by the established Malay elites in dealing with their welfare concerns in the immediate post-war years (Harper 1998). Yet Manderson (1980) suggests that AWAS’ radicalism eventually contributed to its own demise as it lacked populist support, leading to its official dissolution in 1948 with the declaration of emergency (see also in Lim 1985). It was probably difficult for the group to endure lasting support as the symbolism of radical Malay Muslim women was probably dissonant with certain patriarchal beliefs and practices within the community. It is also possible that the that the post-WWII government utilized the media to frame and disseminate the idea that AWAS lacked populist support to curb further endorsement for a group that was calling for the masses to revolt. With the demise of AWAS, its women activists joined mainstream parties, or like Shamsiah, joined the Communist underground (Dancz 1987; Karim 1983 as cited in Heng 1997). As a result of her work with PKMM, Shamsiah forged a relationship with Ahmad Boestamam, and they eventually agreed to marry. As he was already married, Shamsiah agreed to be his second wife. She subsequently justified her marriage as a symbolic merging of her personal and political interests – the marriage would allow her to increase her knowledge of the political struggle, as well as enhance their fight for Malaya’s independence as co-activists. After their marriage, they lived in a rented home in Kuala Lumpur with his first wife. In April 1947, Boestamam was arrested for inciting violence and was slapped with a $1,200 fine or nine months of imprisonment. He had published an API manifesto that threatened a violent fight for independence (“merdeka dengan darah”). Boestamam’s friends managed to raise the fine, but the government eventually banned the API manifesto and the organization. Shortly after, Shamsiah ended her marriage with Boestamam as she was tired of facing criticisms and snide remarks from his mother and sister. She left their home one night, and was thus divorced. Although Shamsiah used to associate women’s emancipation with the nation’s independence in her public speeches, critics often point to her marriage with Boestamam and her uncritical endorsement of polygamy as indicative of her contradictory commitment to women’s rights. It is crucial to note that Shamsiah herself did not initially object to polygamy. In her memoir, she claimed that she came to understand the dislike that Muslim women had for polygamy and the unjust form it would assume in practice. Shamsiah claimed that her negative experiences with her three marriages led to the politicization of her gender consciousness. Through her failed marriages, she realized that women had to endure intersecting oppressions from patriarchy, outmoded customary practices, feudalism, capitalism, and imperialism. She thus began to perceive the nation’s independence as a necessary first step toward attain women’s liberation. After her marriage with Boestamam, Shamsiah became even more involved with PKMM’s grassroots activism. 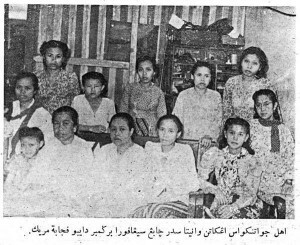 In May 1948, Shamsiah attended a PKMM camp and underwent military and ideological training by Indonesian PKI counterparts. There were 30 members with her, and she and Zainab Mahmud were the only women. Shortly after, she married Wahi Anuar. 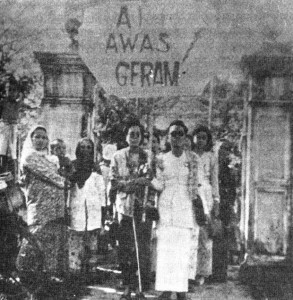 On 20 June 1948, the British government declared a state of “emergency” in Malaya, arresting left-oriented/radical individuals, and banning political organizations such as AWAS. With the declaration of “emergency,” Wahi and Musa decided to leave Kuala Lumpur for Kampung Lubuk Kawah, in Pahang. Shamsiah claimed that they received support from villagers in the form of food and shelter. They managed to avoid being arrested by hiding in the nearby jungle each time colonial officials came. On 21 May 1949, PKMM set up its all-Malay regiment – the 10th regiment – with Wahi Anuar as commander, and Musa Ahmad as the Politics Liaison. Shamsiah was responsible for coordinating messages between their different outposts and spreading information about their resistance to villagers, as well as recruiting military and sourcing for donations. As a guerilla fighter, Shamsiah replaced her baju kurung with military attire. Amidst intensified violence, Shamsiah, Wahi and 20 other guerilla fighters entered the jungle and began their years of armed resistance against the British government. Shamsiah was 24 years old at that time, and was a part of the Ikatan Pembela Tanah Air (PETA) coalition, along with Wahi Anuar as the leader. From 1948 to 1991, she was separated from her family for forty-three years. Late 1949, Shamsiah and the 10th regiment were leaving Temerloh to seek safer refuge when the British surrounded them. The members of the regiment were forced to separate, and many surrendered. Shamsiah was then pregnant, and temporarily lost contact with Wahi. When they reconciled, Wahi had to deliver her baby in a tent. When the baby was less than two months old, the British invaded their camp again. In the process of rescuing her child, Shamsiah found herself lost in the jungle alone. She walked around trying to evade the British. Three PKM members finally found her after three days, exhausted and weak. They informed her that Wahi had surrendered. 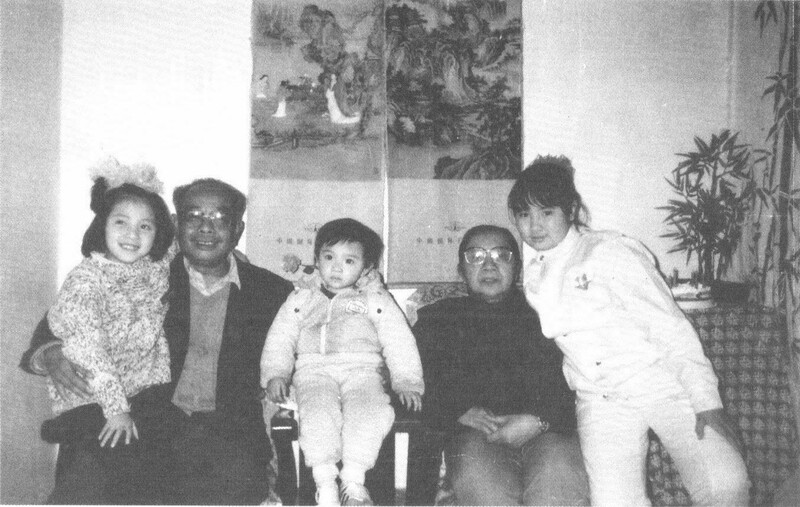 According to Shamsiah, the PKM members brought her to their camp and eventually convinced her to give her child up for adoption to a wealthy Chinese family in the village. Shamsiah agreed as she was determined to continue with her struggle and did not want to endanger her child. In her autobiography, she described her shock when she found out in 1952 that the three PKM soldiers had killed her baby instead. Many years later, she was on the receiving end of harsh criticisms when the Malaysian media accused her of being so blindsided by the fight for independence that she would drown her baby so as to not distract the British and derail the revolution. Shamsiah remained steadfast in her denial of these accusations in her book. From 1948 to 1956, while engaged in armed resistance against the British, Shamsiah ended up lost alone in the jungle for three times. She had to learn how to navigate the jungle in darkness, to rely on her emergency supply of oats, food, and matches, and to evade enemy soldiers. Brought up as a gentle and soft-spoken Malay woman with enough religious education to perform her duties as a housewife, she never imagined that she would one day have to survive in the jungle alone. In 1952, Shamsiah went to Perak to work on PKM’s newspaper Pencinta Tanah Air. In 1953, Shamsiah followed the 10th Regiment on their way to the Malaysia-Thailand border. She worked for the propaganda department of the 10th regiment, and her task was to get grassroots support from the villagers. She worked closely with Ibrahim Mohamed, who subsequently divorced his wife to marry her. Conscious of the fact that this was her fifth marriage, Shamsiah emphasized in her autobiography that their marriage lasted until her death. The 1950s witnessed numerous political shifts. UMNO began their fight for independence, co-opting many former PKMM members, while continuing to distinguish themselves from the communists’ armed resistance. Shamsiah herself began to network with allies in the region. While she was still engaged in armed combat, she was nominated as a committee member of the Global Alliance of Democratic Women in Soviet Union. In 1965, she attended the World Anti-Nuclear and Hydrogen bomb Conference in Tokyo. Later that year, she attended KIAPMA in Jakarta, where she met Ho Chi Minh and Soekarno. In Indonesia, however, the Indonesian intelligence arrested Ibrahim and her and sentenced them to jail, accusing them of interfering in Indonesia’s politics. They were imprisoned for two years before they were released. From 1956 onward, Ibrahim and Shamsiah lived in China, sent by the PKMM to acquire leftist ideological training. They got to China by using fake identity cards to board a Denmark ship that sailed from Bangkok to Guangdong. There, they took a train to Beijing, where they lived as foreign guests of the Chinese Prime Minister. On 19 July 1957, Shamsiah gave birth to her son, Shamsudin, in Beijing. In Beijing, Shamsiah and Ibrahim worked at the Beijing International Radio Station under their Malay language transmission division. After years in broadcasting, the party dismissed both of them in 1968. The party accused them of being traitors, as they were critical of the leadership. They had to quit their radio jobs and leave the party. They were also placed under house arrest for two years. Despite this, they did not have to leave China due to their status as former anti-imperialist fighters. In 1972, the party moved them and other former members to Hunan. They had to work at a ball-bearing factory as laborers, and although they had the title of cadres, earned just enough to raise their family. In her autobiography, Shamsiah glossed over many details of her everyday life in China. In 1979, Shamsiah came across an Utusan Malaysia article informing her of her mother’s death. Her brother had publicized their mother’s death and encouraged her to surrender. On 2nd December 1989, the Malaysian government and PKM signed a peace treaty in Haadyai, Southern Thailand, leading to the disarmament of PKM after forty-one years. All former guerrilla fighters could return to Malaysia. Shamsiah herself had begun her application to return to Malaysia from 1985, facilitated by Mahathir Mohamad. On 23 July 1994, Shamsiah and Ibrahim finally returned to Malaysia. They retained all their rights as Malaysian citizens. Despite her years of armed struggle, and her exile in China, critics have accused Shamsiah of being a naïve Malay woman who did not really understand the ideological implications of her actions, and was swayed by communist propaganda. To that, she wrote in her autobiography, “Actually, I was not the female leader of the Malayan Communist Party, or a renowned female authority. I was just a woman warrior who fought the British for the nation’s independence and for women’s emancipation.” Yet her articulation of support for women’s emancipation precluded several crucial factors such as her initial support for polygamy, her seeming acceptance the masculinist-hegemonic leadership structure of the PKMM, and her uncritical endorsement of Mahathir Mohamad. In spite of the Shamsiah’s contradictory political sentiments, her story constitutes an important fragment of Malay history that is worth telling and remembering. Even so, the historical amnesia surrounding women like Shamsiah is startling — as an undergraduate, I never encountered professors who assigned readings on the subject. Although the initial publication of her book by University Kebangsaan Malaysia in 2004 caused controversy, the Strategic Information and Research Development Centre (SIRD) published a new edition that was subsequently translated into Chinese in 2007, one year before her demise. How does knowing and recognizing this aspect of our history centered on radical Malay women compel us to re-think the ways that we often conceive of gender roles as timeless and essential (eg. the gentle, docile, Malay woman), when they are in fact subject to political economic shifts? How do the mainstream media frame certain historical phenomena such as the communist resistance in Malaya and Singapore as pejorative to the nationalist struggle? Moving forward, how does acquiring knowledge about AWAS’ activism prompt us to re-think the notion that Malay women in the region eschewed public participation and were historically disinterested in politics? Dancz, Virginia H. 1987. Women and Party Politics in Peninsular Malaysia. Singapore : Oxford University Press. Harper, Timothy N. 1998. The end of empire and the making of Malaya. Cambridge: Cambridge University Press. Heng, Geraldine. 1997. “A great way to fly”: nationalism, the state, and the varieties of Third-World Feminism.” Pp. 30-45 in Feminist Genealogies, Colonial Legacies, Democratic Futures, edited by M. J. Alexander. London: Routledge. Lim, Seow Y. 1985. “Women in Singapore politics 1945-1970”. Academic exercise, Dept. of History, Faculty of Arts and Social Sciences, National University of Singapore. Manderson, Lenore. 1980. Women, Politics, and Change: the Kaum Ibu UMNO, Malaysia, 1945-1972. Kuala Lumpur ; New York : Oxford University Press. Nurhaizatul Jamil is a Ph.D. candidate in Anthropology at Northwestern University. Her research focuses on women’s informal Islamic religious education. She is broadly interested in gender, history and political economy, race and postcoloniality, and social media. GERAM was a Singapore-based organization, their solidarity became symbolic of broader Malay solidarity within the archipelago. Posted in 14 "Yang Tersirat"
This work is licensed under a Creative Commons Attribution-NonCommercial-NoDerivs 3.0 Singapore License.